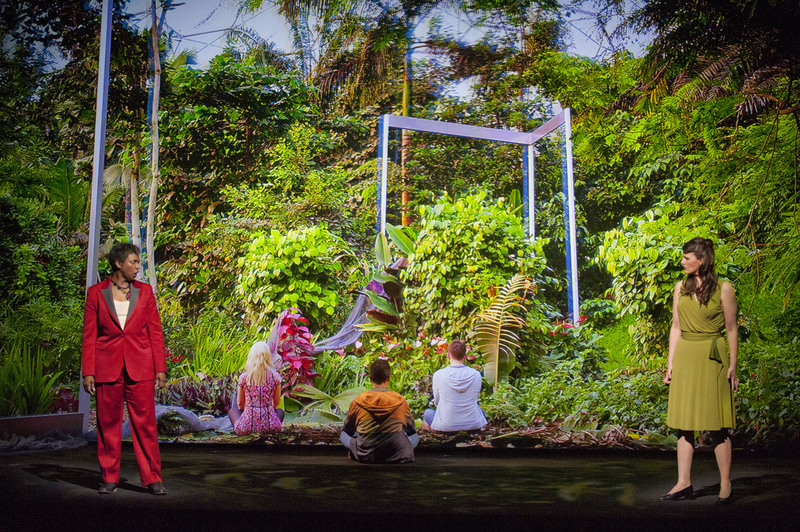 This new musical work by Michel van der Aa, combines film narrative and a 3D visual world behind a screen, to a libretto by novelist David Mitchell. Novels are very different from opera librettos, which must develop the characters and story in relatively few words, and part of the problem with this one is that it was difficult to care what happened to these people. There were three main ones: Toby Kramer a wannabe video artist, Zenna Briggs who pretends to want to fund his work but really wants to draw him into a strange world of disappearances, and Doctor Marinus who works in a psychiatric hospital. Roderick Williams as Toby sang with excellent diction, but the ladies with their high notes had more trouble, and were not helped by the orchestration. Surtitles were needed, and I heard the people behind me commenting afterwards that they didn’t understand what was going on. A story as strange and convoluted as this one has to be delineated very carefully to work on the opera stage, and a quick read of David Mitchell’s own synopsis hardly gives a luminous rendering of the plot. 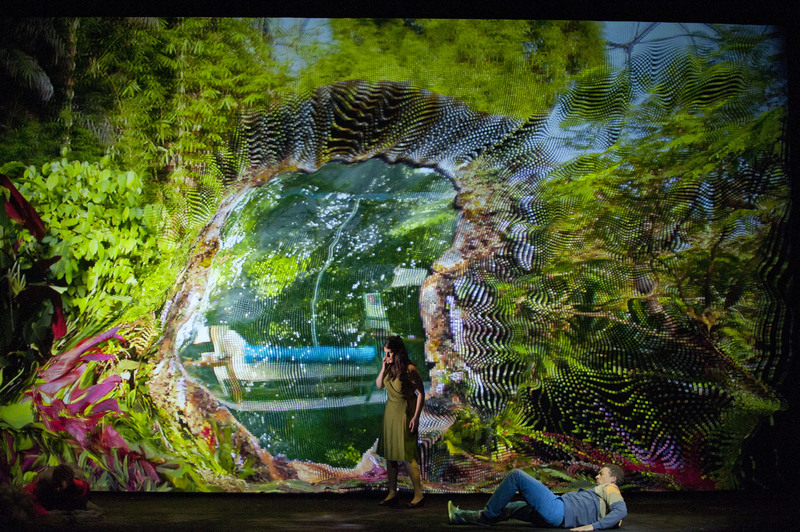 One can of course sit back and enjoy the colourful 3D garden with its vertical pool, which comes in about halfway through, but friends who were on the side upstairs evidently did not see the same effects as I did from the centre stalls. In the Garden are two lost and vanished young people, Simon and Amber, both suffering terribly from guilt, and we see on-screen interviews with his landlady and her mother before they disappeared. It turns out that they are not the only ones to suffer from psychiatric problems, but I was rather past caring by that time. This reminded me of Judith Weir’s unsuccessful Miss Fortune at Covent Garden last year, but it does not compare with the ENO’s Two Boys, despite a preview comparison that I read. That had a compelling story; this didn’t. Katherine Manley and Claron McFadden both sang well as Zenna Briggs and Doctor Marinus, and the diction problem could and should have been solved by surtitles. Whether that would have made this rather opaque story more engaging I doubt, but it would have helped. 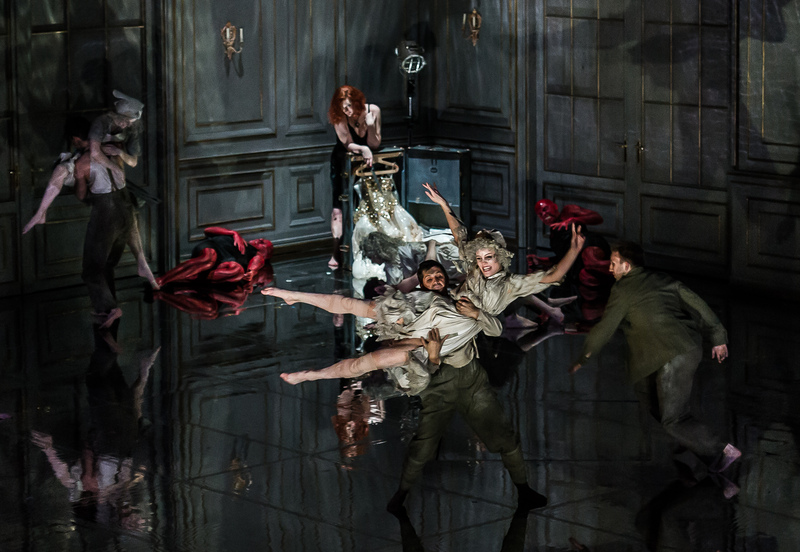 This ‘film opera’, co-produced by the ENO, Opéra de Lyon, Luminato Festival and Holland Festival, will doubtless attract favourable comments for the composer’s combination of music, film footage, and 3D electronic world, but the music is dull, and the libretto a serious weakness. Performances continue until April 20 — for details click here. Spectacular success for the ENO gives audiences the British premiere of this baroque jewel that has lain in the shadows for about 300 years. With an excellent libretto by Thomas Corneille, well translated by Christopher Cowell, this terrific production by David McVicar makes compelling theatre. Excellent choreography by Lynne Page suits both music and drama, Paule Constable’s lighting gives a very effective atmosphere, and Bunny Christie’s designs are terrific. The whole thing is set in 1940s wartime, with Creon as head of a French army, Jason a Royal Navy Captain, and the airmen American. Jason is needed to help fight for Corinth, and Creon is only too happy to banish Medea, offer Jason his daughter Creusa as a bride, and ignore Orontes, Prince of Argos who expects to wed her. The interests of Orontes and Medea naturally coincide, but Creusa being in love with Jason, firmly rejects Orontes, and Medea, as her name implies (it’s related to the Greek verb μηδομαι meaning cunningly plan or contrive), decides to exact vengeance on Jason. 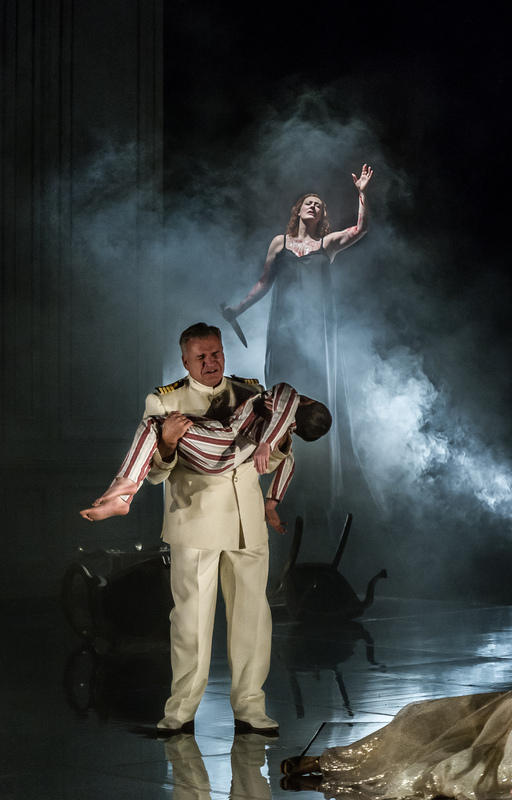 The turning point is in Act III, between the two intervals, when Jason’s dissembling and scheming is fully revealed to Medea and she decides to invoke the supernatural powers she embodies. At this point Charpentier’s music gives her more colourful harmonies, and though audiences in 1693 might have objected, we are entirely ready for them, and the whole effect is a musical treat. 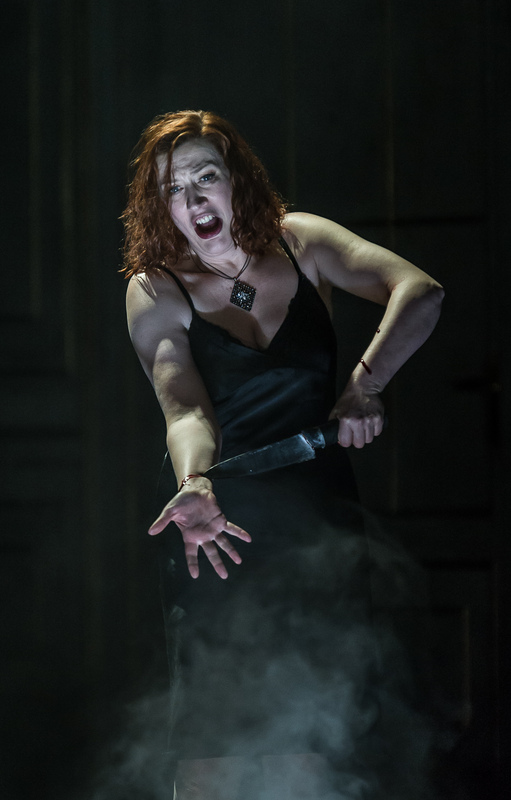 Sarah Connolly was a marvellous Medea, sure of voice, stage presence and theatrical impact, a woman who can summon demons from the depths in Act III, and dispute Creon’s will in Act IV, bringing in wish maidens to drive him crazy. The underlying idea in that scene is that Creon’s relationship with his daughter Creusa has already shown a somewhat incestuous impropriety, and he is an easy victim. Creon himself was brilliantly sung and acted by Brindley Sherratt, and Katherine Manley gave a beautiful performance as Creusa. Roderick Williams sang forcefully as Orontes, showing admirable emotion in Act IV, while Jeffrey Francis gave a calm but rather wooden portrayal of Jason. In the end the dead bodies of his young sons are brought in, and Medea ascends to the heavens witnessing her final terrrifying act of vengeance. Fine dancing and body movements by the twelve dancers in their multiple roles, and it is a pleasure to see effective choreography, unlike some recent productions at a nearby opera house in London. Super conducting by Christian Curnyn brought out the intriguing nature of the music. The big boss of French music in the seventeenth century was Lully who fiercely protected his territory, but Charpentier was arguably a better composer, and Medea is a masterpiece. Whether you like baroque opera or not, a production of this calibre it is a must-see. Unmissable. Performances continue until March 16 — for details click here.